Now that the excesses of Christmas are well and truly over, and the lashings of New Year champagne are a distant memory, most people find their minds drifting over to turning over a new leaf. Health and wellness beckons, the spiaralizer comes out of the cupboard and the bottles of wine are replaced by green smoothies and gym gear. Dry January is the first port of call for a lot of adults; sick of glugging down the funny juice, you start to feel like your liver needs a bit of a break. Did you know that 16% of UK adults took part in dry January last year, I know, right?! 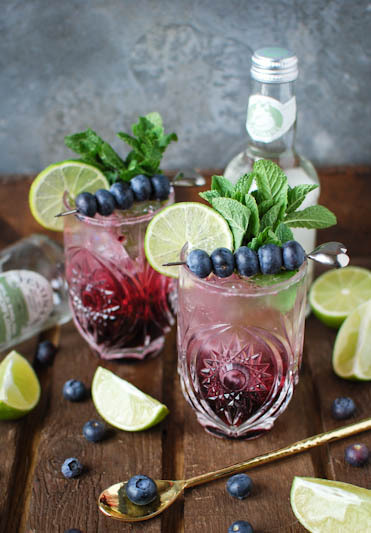 So here’s a fruity little number to help keep you on the straight and narrow, this blueberry and elderflower virgin mojito is sweet enough to make sure you’ll never even miss the rum. This Janurary I’ve teamed up with Fentimans to bring you a delicious mocktail that will have you in the party spirit, without the need for booze. 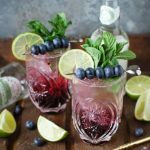 This blueberry and elderflower virgin mojito is so damn tasty you’ll forget that the rum is even missing. I used Fentimans Wild English Elderflower as the base for this cocktail. It’s so delicious I’d be perfectly happy drinking it over ice, but add a bit of blueberry syrup and mint and you’re on a whole other planet! 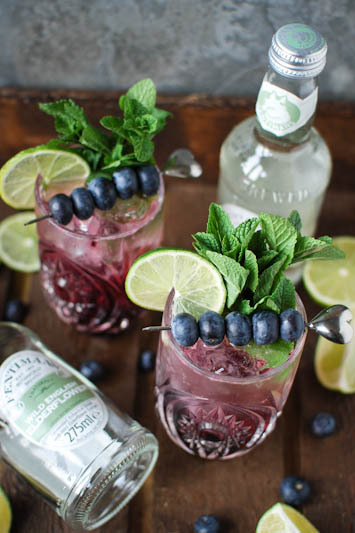 This blueberry and elderflower virgin mojito is sweet enough to make sure you’ll never even miss the rum. For the blueberry syrup, combine all the ingredients in a small saucepan and bring to the boil. Reduce to heat to a simmer and cook for 10 minutes. Allow to cool completely. To make each mocktail put 1 1/2tbsp of syrup in the bottom of each glass followed by the mint leaves. Muddle the syrup and leaves together. Add the lime juice, fill up the glass with ice then pour over the Wild English Elderflower soft drink. Give the drink a little stir and garnish with a little extra mint and some lime wedges. mmm sound lovely & refreshing! Love these flavours so will definitely be giving them a go!